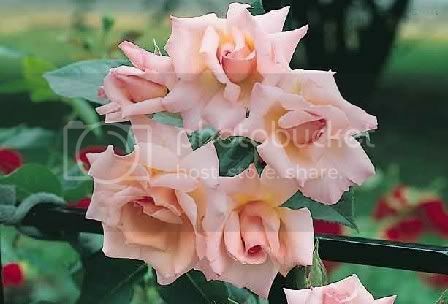 Photo / pic / image of a "Compassion" climbing rose. Sheep, pigs and dogs of various names have been in the media over the past few years as examples of species that have undergone cloning. Well, let's look at carrying out a bit of cloning ourselves. I am going to show you how to take cuttings from a plant that impresses even non-gardeners, the climbing or rambling rose. Many of us grow these classically beautiful Irish garden plants. Throughout the country, rambling roses grow over arches or trail through hedging. These flexible specimens are bolstered by the tidier climbing roses which grow against a many a sunny wall and porch. Now, an opportunity may come up sometime in the future where you will need a new climbing / rambling rose or maybe you want to create a back-up in case the original fails. This can be very important if the rose is a family heirloom or is quite hard to find. To start take a cutting about 30cm (12 inches) long from a shoot produced this year, nip off the top of the cutting leaving it 23cm (9 inches) long. Create a straight cut across the base just below a leaf and a bud; follow this by removing all the thorns and leaves whilst leaving just a pair of leaves at the top. Create a trench in your garden soil approx 15cm (6 inches) deep in a partially shaded spot, ensure one side of the trench is vertically straight and place a thin layer of coarse sand in the base. Dip the base of each cutting in a rooting hormone and place in the trench with the stem against the straight edge. Space the cuttings at 15cm (6 inches) apart; I would suggest setting ten cuttings to ensure you gain at least one viable plant. Backfill the soil around the cuttings and water heavily, do not allow the new plants to dry out and within a year you will be ready to pot up or transplant. If you have seen a particularly beautiful climbing or rambling rose on your travels, why not take some cuttings the next time you pass. Just remember to ask the permission of the garden owner, ensuring you do not have to under-go D.N.A tests two or three years down the line, ala "Tricia" or "Rickie Lake".